George Sand’s Haiti. George Sand was a French woman writer born in 1804, same year as Haiti gained independence from France in a slave revolution. Epigraphs of classical French writing by Sand, a woman considered revolutionary in her own country, are juxtaposed against Haitian history, music, dance, street scenes, and cuisine. On the first trip to Haiti, I brought along George Sand’s Lettres D’un Voyageur, the one French-based travel book in my collection. As I began to read, I saw connections between the book and the country that were interesting to me. A number of the poems follow epigraphs from Lettres. Poetry chapbook including narrative sequences and shorter imagistic poems. I’d like to see Judy Davis as narrator of the poems as she played Sand in the 1991 film Impromptu. As George Sand captured the sights, sounds, and tempo of her time in Lettres D’un Voyageur, the narrator observes Haiti from the period 2008 to 2010. The chapbook was co-winner of a 2012 poetry contest sponsored by Poetry West in Colorado Springs, Colorado, published in 2013. The poems were written over three years, largely on three trips to Haiti, both before and after the 2010 earthquake. What other books would you compare this one to within your genre? The first that comes to mind is Sand’s Lettres D’un Voyaeger, and although not in the poetry genre, it captures the introspection and observations of the landscapes in Sand’s travels; also, the travel writings by contemporary poet Ruth Moon Kempher. The idea of a scheduled trip to Haiti in 1988, canceled due to political unrest, stayed with me for years. In 2008, I was asked to accompany a member of a lay religious order traveling to Gonaives, Haiti to install local women in a newly formed chapter. As my travels are usually alone, this was an interesting (and safe) way to see the country. I was born in Philadelphia, birthplace of America’s revolution; and Gonaives (100 miles up the coast from Port-au-Prince over what was—until very recently—a difficult road) is the birthplace of Haiti’s revolution. 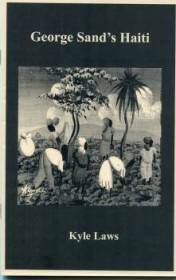 The isolation of Gonaives, and the feelings by the people of being outsiders in their own country, appealed to me as a poet. Haiti is the first black-led republic in the world, founded not long after America’s own revolution. It is a country that remains in continual rebellion. The philosophical implications of its culture, largely dependent on charitable giving, are complex in ways that cause you to rethink your own values regardless of where on the spectrum you start.